Staging or prepping the trigger — taking up the slack on a modern striker-fired pistol — is advocated by some as it helps the shooter make a shot that needs a high level of precision. 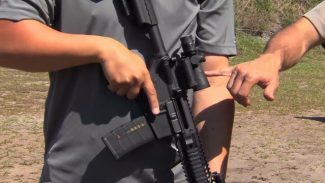 But Rob Pincus encourages defensive shooting students not to prep the trigger, because it is a technique designed for marksmanship or target shooting, not self-defense. When shooting at a non-moving paper target, holding your gun and body as still as possible, including controlled breathing, helps you shoot ultra-tight groups. In defensive shooting, you are usually trying to make one precise shot at close range on a relatively small target such as a head, or at distance on a larger target like a torso. 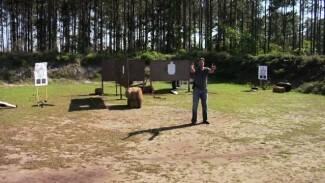 In these defensive situations, your gun and body positions must be more fluid in order to follow your sight picture and sight alignment on a three-dimensional human target who is most likely moving. 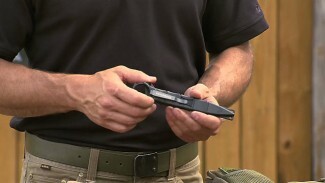 Rob demonstrates the body positions for target and defensive shooting, and prepping the trigger as opposed to a smooth trigger press. At the range we’re firing at static targets. How can we train and practice for defensive situations when the targets aren’t moving? We must compensate for that with training discipline. We do what works best not in the range environment but what works best for our anticipated actual fight. Focus on a defensive shooting posture — weight forward, lowered center of gravity, arms locked out in front of the body –and smooth trigger press. We don’t need to know the exact micro-second the gun is going to go off. We just need to know that the gun is going to go off. 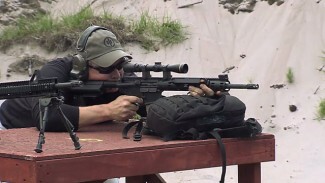 Maintain sight alignment and sight picture, smooth trigger press, and let the shot happen.